One word . . .Evil. 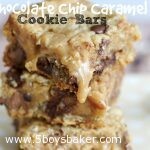 That is what these chocolate chip caramel cookie bars are, pure evil. In the world of bar cookies, these are pretty dang amazing and rank right at the top of my list. They are really similar to oatmeal carmelitas, which I’m sure you’ve all had before (if you haven’t, then you are truly missing out), but they have peanut butter in dough and the caramel layer has sweetened condensed milk in it (oh come to mama!!). They are beautiful to look at and beautiful to eat. 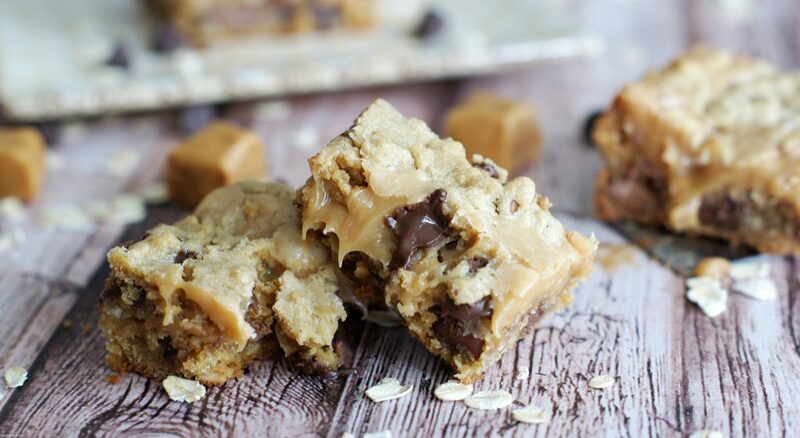 A delicious layer of peanut butter oatmeal chocolate chip cookie dough, followed by a decadent layer of melted caramels and sweetened condensed milk and topped off with more of the cookie dough. . . .I mean really, what’s not to love? You really need to make these! Preheat oven to 350 degrees. Line a 9x13 inch baking dish with parchment paper. Unwrap caramels and place in a small saucepan with butter and sweetened condensed milk. Cook over medium-low heat, stirring occasionally, until caramels have fully melted and the mixture is nice and smooth. In the bowl of an electric mixer, cream butter and sugar together in a large. Add peanut butter and continue mixing until well combined. Add eggs one at a time, mixing well after each egg, stir in vanilla. Combine flour, oats, baking powder, and salt in a small mixing bowl. Add the flour mixture slowly stirring until well combined. Stir in the chocolate chips. Spread 2/3 of the dough on the bottom of the pan. Slowly pour caramel mixture evenly over the dough. Take scoops of the remaining dough and flatten them slightly in your hands and place over top of caramel layer. This doesn't have to be perfect and the entire top doesn't need to be covered. Bake for about 30 minutes or until edges just barely begin to turn golden brown. Don't overbake these!